The MedTech Europe Code of Ethical Business Practice regulates all aspects of the industry’s relationship with Healthcare Professionals (HCPs) and Healthcare Organisations (HCOs), such as company-organised events, arrangements with consultants, research and financial support to medical education, amongst others. It also introduces an independent enforcement mechanism. Such a Code is key as it aims at ensuring that all interactions between companies and Healthcare Professionals (HCPs) and Healthcare Organisations (HCOs), such as hospitals and clinics, are ethical and professional at all times, and beyond criticism to maintain the trust of regulators, and – most important of all – patients. MedTech Europe is committed to promote legitimate and ethical business practices, encouraging responsible and ethical interactions with HCPs and HCOs. 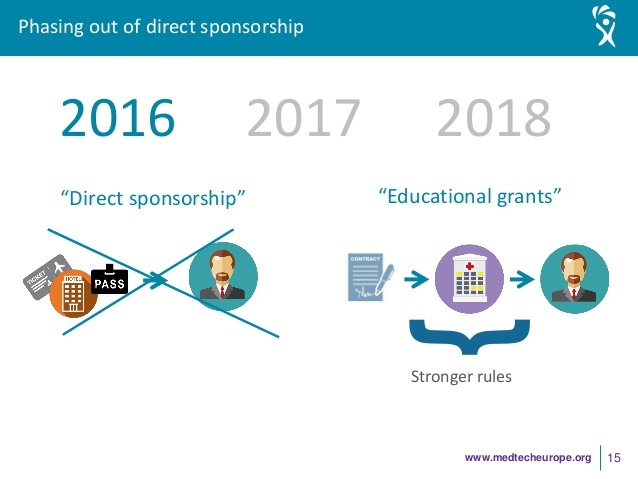 As of 01 January 2018, member companies of MedTech Europe will no longer be able to finance directly the participation of healthcare professionals to third party organised educational events, regardless of whether the professionals are acting as speakers or merely as participants. – For third-party organised conferences (main pro- gramme): Companies will not be able to directly support an HCP, neither as a delegate nor as a speaker. – For company-organised events in the framework of third-party organised conferences (e.g. satellite symposia): Companies may directly support speakers (i.e. their consultants) but not delegates. – For third-party organised procedure/hands-on trainings: Companies may support delegates but not speakers, the latter being independent. – For company-organisedproduct/proceduretrainings: Companies may directly support an HCP either as a delegate and/or as a speaker. Learn more about industry grants for this congress here.